Looking Back and Seeing Now is an immersive, kinetic, site-specific installation which transformed the gallery of the Berkeley Art Center into a meditative space for a dialogue between history and the present. Two large-scale drawings, based on photographs belonging to the artist's grandmother, were installed on opposite sides of the gallery, facing each other. Suspended from the gallery's ceiling beams was an inverted pyramid of two hundred tambourines whose drums had been altered with mirrored disks, enlarged details of eyes from the portraits, lambskin, and suede. Fans caused the tambourines to spin slowly, creating a gentle rustling of bells reminiscent of the sound of rain, while blue theatrical lights created shadows that moved across the gallery walls. 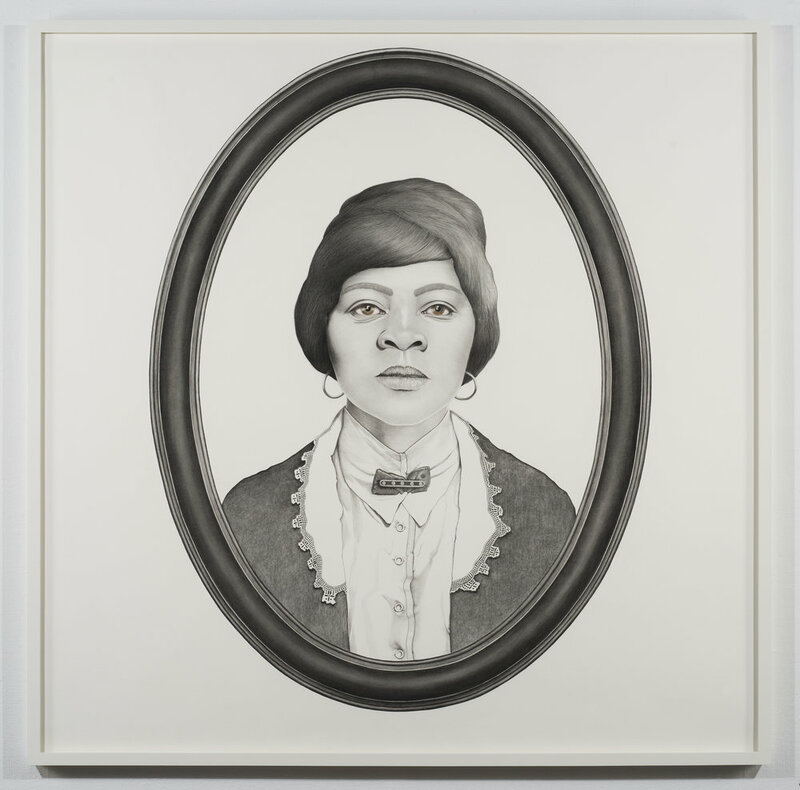 As the silent faces of the two women from a past era regard the audience, history confronts the present, challenging the viewer to ask what has changed and what remains the same. As the mirrored tambourines spin, they reflect everything around them, such that viewers will literally see themselves within it. And as they watch the jangling cloud turn, it watches them back, forcing an exchange of mutual acknowledgment. The piece is not like a conceptual puzzle offering a specific correlation between each of its parts that alludes to an underlying thesis. It's more comparable to a poem, in which signifiers contribute to a host of possible meanings drawn out by the viewer. It's meant to be a catalyst for contemplation.